Krishan Bheenick discusses various online interaction platforms for exchanging information, from email-based platforms and Dgroups to knowledge management blogs. ‘How did we manage online communities prior to the advent of social media?’ you may ask. Very much the same way a lot of stakeholders in agricultural and rural Development still do it today – using email-enabled online discussion forums. One of the better known email-ba sed online interaction platforms that is currently being used is the Dgroups.org platform. It started as a shared platform among development organisations to help inform exchange between their communities of practice, without advertisements! This platform includes more than 700 active communities, 150,000 active users, working in international and intergovernmental organisations, government agencies, national and international NGOs, and ICT- and knowledge-focused institutes. Over 400,000 email messages are delivered each day through the Dgroups servers, and over 50% of these emails are exchanged with and within African countries. The basis of Dgroups is that it combines the features of a mailing list with that of a discussion forum into one tool, with the advantage that you can create sub-communities within a larger one. Prior to the explosion of social media people used email as the main channel for exchanging information, and quite successfully too. This method has been useful for most countries in the ACP regions, where email is still the dominant means of electronic communication. The Dgroups platform is specially designed to be used in low bandwidth conditions, where people do not have full-time access to the web: it converts large attached files into links so as to avoid clogging up personal mailboxes. Furthermore, shared documents are also placed in a ‘library’ that the community can access at any time, and newcomers can always revisit past discussions of the group. Obviously, social media enhances the quality of the knowledge exchange where it is possible, and the Dgroups platform has also adapted by providing a web interface. Current improvements include the development of an application program interface for Dgroups. The platform is managed by a consortium of development partners (see box about dgroups.info) and is also proposing that projects could use the platform as their communications platform, in addition to social media platforms. The current solutions used at CTA and its regional partners combine a mixture of both email based communications and social media. The Forum for Agricultural Research in Africa has been using Dgroups on a large scale, coordinating multiple communities and their subgroups, which include sub-regional, national, thematic and institutional sub-communities. Discussions are being held with the Secretariat of the Pacific Community’s Land Resources Division to look into shifting its Pacific Agricultural and Forestry Policy Network into a Dgroup Community with several sub-communities so that multiple e-discussions can take place. Similarly, the emerging online communities on extension and rural advisory services, coordinated by the Global Forum for Rural Advisory Services may also consider using Dgroups as an information sharing platform. From a knowledge management (KM) perspective, communities of practice represent the pool of tacit knowledge and experience about a particular domain or topic. Etienne Wenger, who is associated with the term ‘community of practice’, provides an overview of how COPs share their knowledge (see the brief at http://bit.ly/1i5eIm1). CTA is itself establishing a community of practice among ACP stakeholders working in the field of knowledge management for agricultural and rural development (KM4ARD). As part of its Knowledge Management and Communications programme, CTA is establishing a blog to relate stories and experiences with applying KM4ARD in the ACP region. 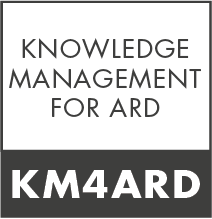 Launched in late 2014, during the month of #knowvember (a month dedicated to reflecting on and recognising initiatives in knowledge management) this blog is regularly updated with news and online resources on knowledge management for agricultural and rural development (KM4ARD). Over 50 stories are featured in the KM4ARD blog on knowledge management experiences in ACP countries. Various resources developed by CTA over the past few years are also featured on the blog, the latest being the adaptation of the knowledge management scan for individuals to carry out a self-assessment of their capacities for KM. The tool also provides the user with feedback on which resources they could use to improve on their weaker areas that have been identified. You can access the KM scan by simply registering on the KM4ARD blog. CTA has also developed a set of training materials to introduce Knowledge Management for Agricultural and Rural Development, which will be offered at regional training workshops in 2016. The participants at KM workshops will be grouped within a Dgroups community to continue to share their experiences across the ACP regions. The community of practice will also be monitoring other existing communities for insights to be shared and will also contribute its exchanges to the other communities. CTA is also one of a group of 13 institutions collaborating on the creation of e-learning materials on information and knowledge management, constituting the Information Management Resource Kit ( IMARK). The main objective of this partnership-based e-learning initiative is to develop the capacities of individuals and support institutions worldwide in the effective management of information. This consortium of institutions offers a range of online learning resources for free, on CD-ROM in French, English and Spanish, and as a downloadable package. Each IMARK module focuses on a specific area of information management, with a curriculum designed, developed and reviewed by experts in the subject matter. The modules are being developed using the latest methods in e-learning, providing an interactive environment for self-paced learning, and one of these deals with the issue of building and maintaining communities of practices. So support is available for the continuation of email-based online communities of practice, which can be complemented by social media. Krishan Bheenick is senior programme coordinator of knowledge management at the Technical Centre for Agricultural and Rural Cooperation in Wageningen, the Netherlands. This article is re-blogged from the recent issue of ICT Update published earlier in February 2016. Read other stories from the issue here. Is experience capitalisation only a task for external consultants? Jorge Chavez-Tafur disagrees. He thinks grassroots communities and networks can successfully follow an experience capitalisation approach to reflect on their experiences, draw concrete lessons, and improve on effectiveness and efficiency of their interventions.